Creating beautiful floral arrangements with preserved flowers leaves you with something handmade that you will love and won’t have to throw away in a week or two! 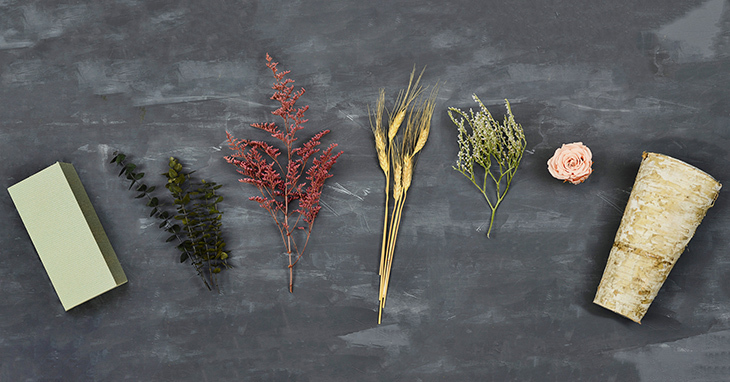 Enjoy your own natural bouquet for years to come by selecting your favorite dried or preserved components. For this particular bouquet, we chose to use a variety of different flowers to create a playful and sweet fall inspired arrangement. To help emphasize the natural look of the arrangement, we also decided to use a birch bark vase–but you can use any materials you like! First, you will want to gather your materials together! 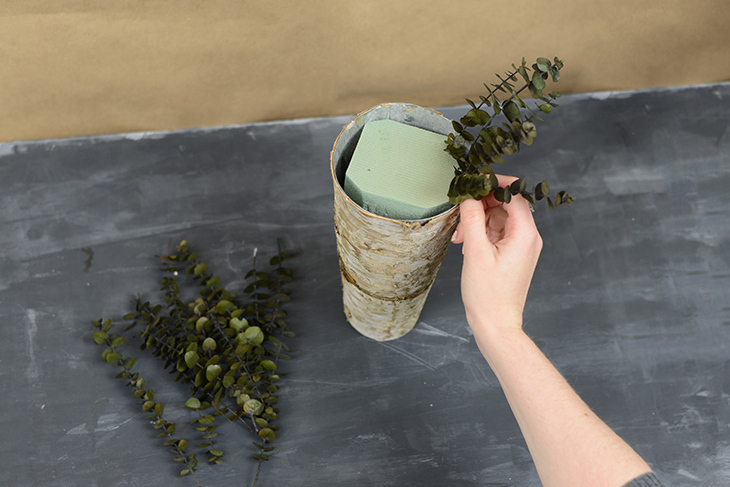 Here you can see each of the components that we used as well as a block of floral foam and our birch bark vase. 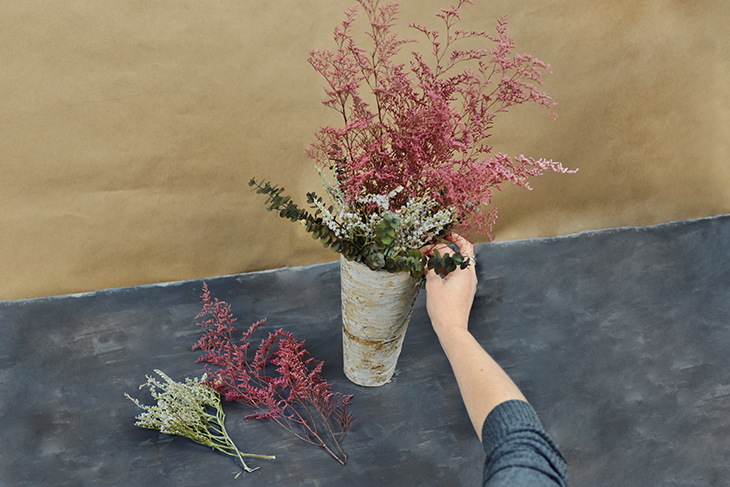 Start by cutting the floral foam down to fit inside your vase. It doesn’t need to look perfect because you’re just using it to give your arrangement some structure. Next, cut the eucalyptus into smaller sections and secure each sprig inside the floral foam, focusing on the outer rim of the vase. Once your eucalyptus is in place, the outer edges of the floral foam should be well-covered. Next, you want to build the body of the arrangement. Take the dusty caspia and secure it in the center of the foam (you can use large or small pieces depending on how tall or full you want the final bouquet to be). 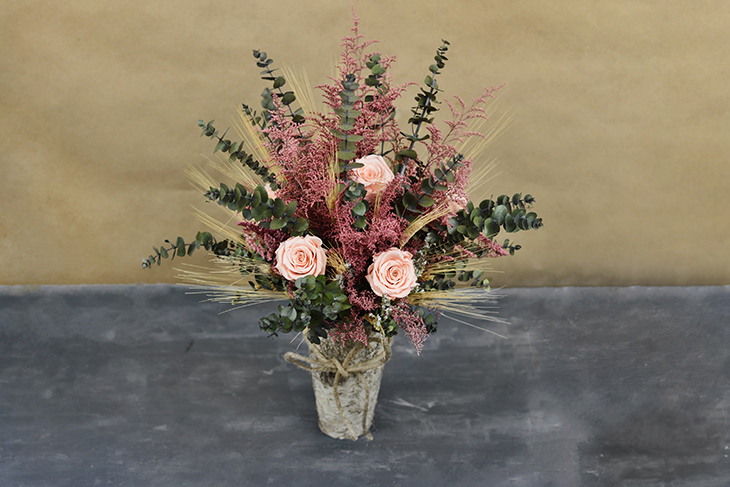 Fill around the caspia with pieces of German statice and longer lengths of eucalyptus. The arrangement was filled out by strategically placing more caspia, larger pieces of eucalyptus. Something to take note of is to interchange the different florals so you don’t create an extremely uniform look. A little bit of randomness looks nice in this arrangement. If you’re using preserved rose heads, you need to attach them to stems. You can use an ochi rose stem, floral wire, or make your own (which is what we did here). We used wooden dowels covered with avocado colored craft paint. 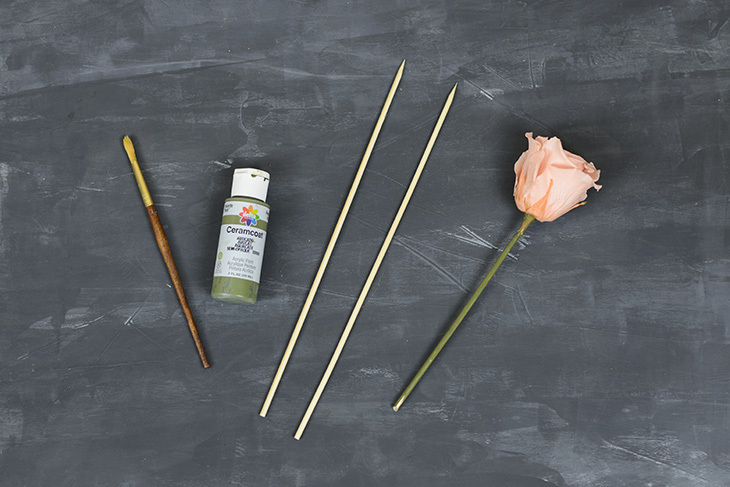 After the paint had dried, we stuck the heads of the roses onto the pointed end of the stick. Don’t push down too hard, you could end up damaging the rose heads. Finally, you want to add the little details to the piece to make it stand out! 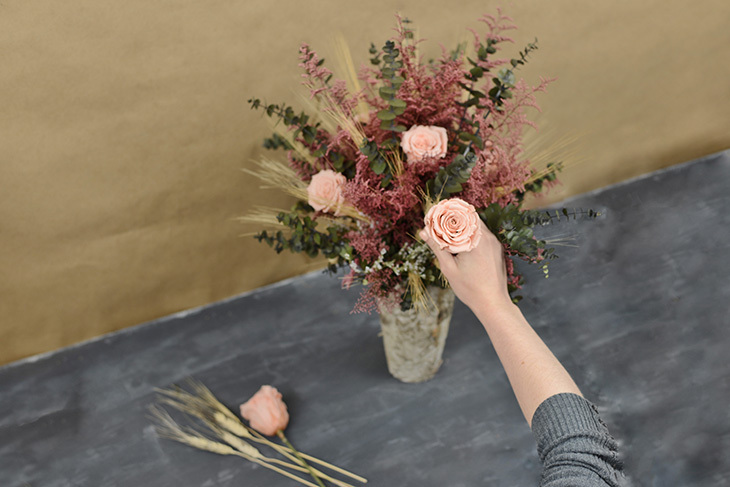 Garnish the whole bouquet using dried wheat and roses. Place them all around the arrangement, but not all in one spot. Make sure each rose head gets its own little section of the vase. If you’re feeling especially fancy, add a jute rope bow to the front of it and voilà you have a beautiful preserved floral arrangement!